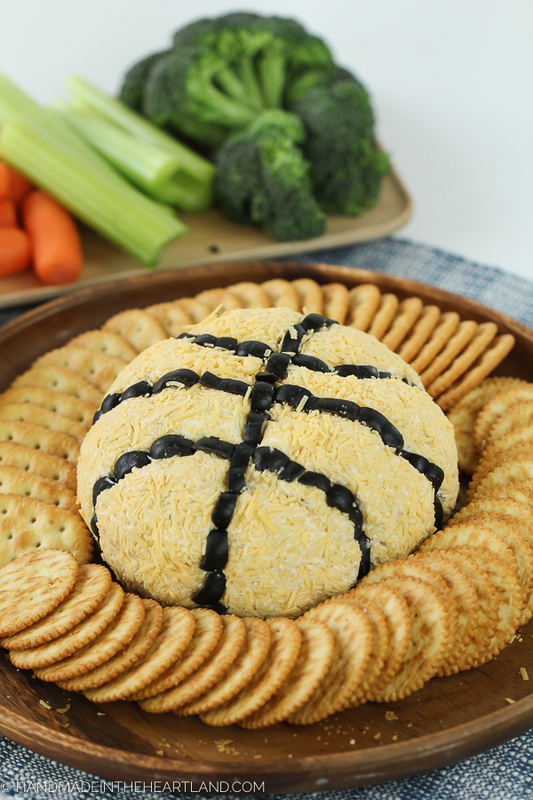 This french onion basketball cheeseball is the perfect appetizer for March Madness parties! This post is sponsored by AE Dairy, all opinions are always mine! Is your bracket busted yet or are you on a roll? 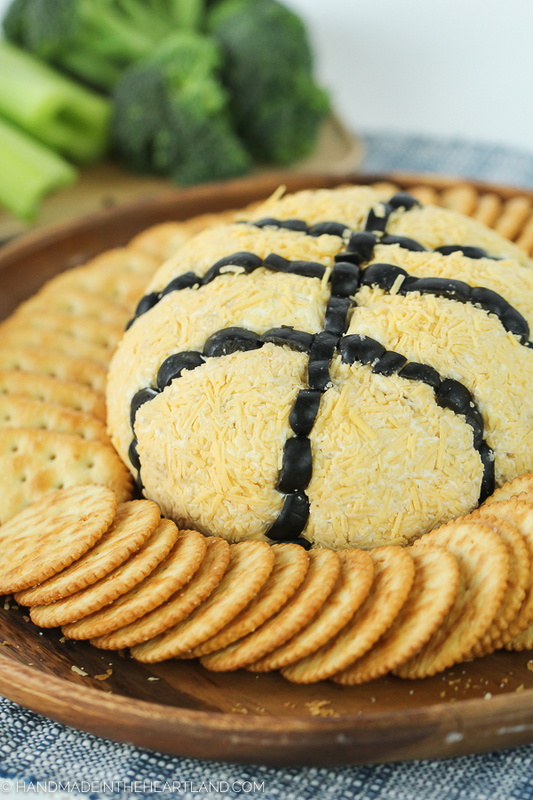 Regardless you have to make this cheeseball for your March Madness watch parties. It might be my favorite cheeseball to date, and I’m kind of the cheeseball queen. What makes it so special? 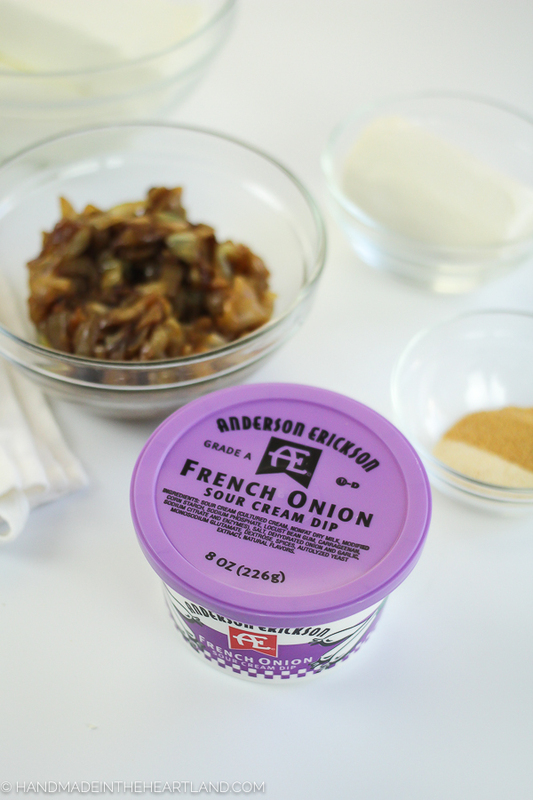 AE French Onion Dip. To taste it is to love it, as I’m sure you already know. I wanted to make a cheeseball that made everyone dig right in and friends, this is it. 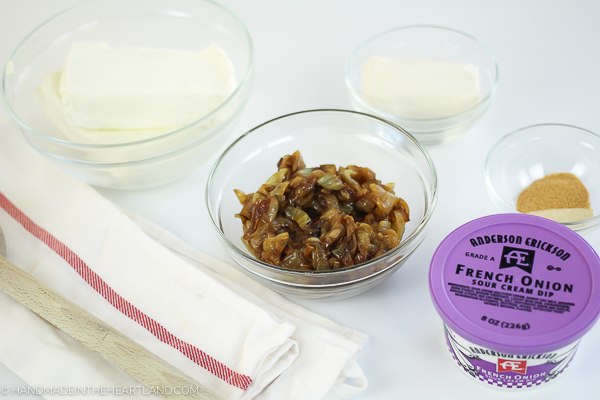 I combined AE French Onion Dip with fresh made caramelized onions, cream cheese, goat cheese, and some spices. How do you make anything better? Add caramelized onions. Am I right?! I like to mix all my ingredients together in my stand mixer. 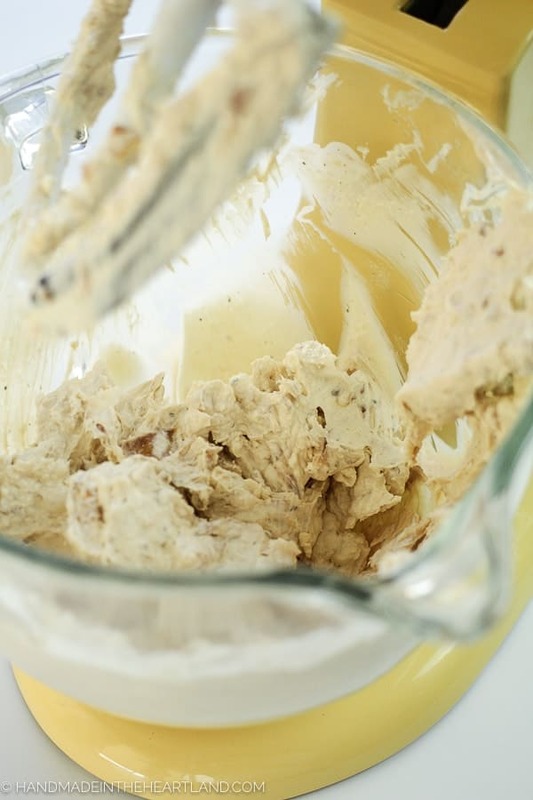 One of the keys to making a great cheeseball is to make sure your cream cheese is softened, and for this recipe your goat cheese also needs to be at room temperature. As you know from my chick, Easter bunny, turkey and leprechaun cheeseballs I’m a fan of dressing up a cheeseball for the season. How easy is this one?! All I did was cut black olives in half and then stick them into the cheeseball. Watch the video below to see how it’s done! What do you think? 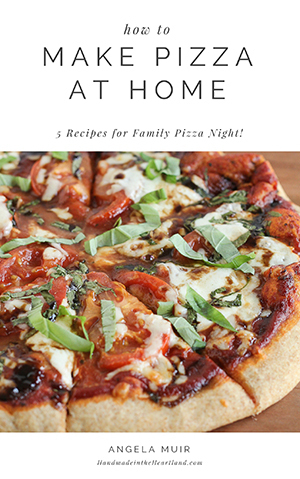 Are you going to make this recipe for March Madness? If you make one please be sure to let me know! It thrills me to see you making things from the blog! Leave a comment or tag me on Instagram (@handmadeintheheartland) or facebook! This french onion cheeseball is bursting with delicious french onion flavor, it’s sure to be a hit. The best way to celebrate any holiday is with a festive cheeseball! 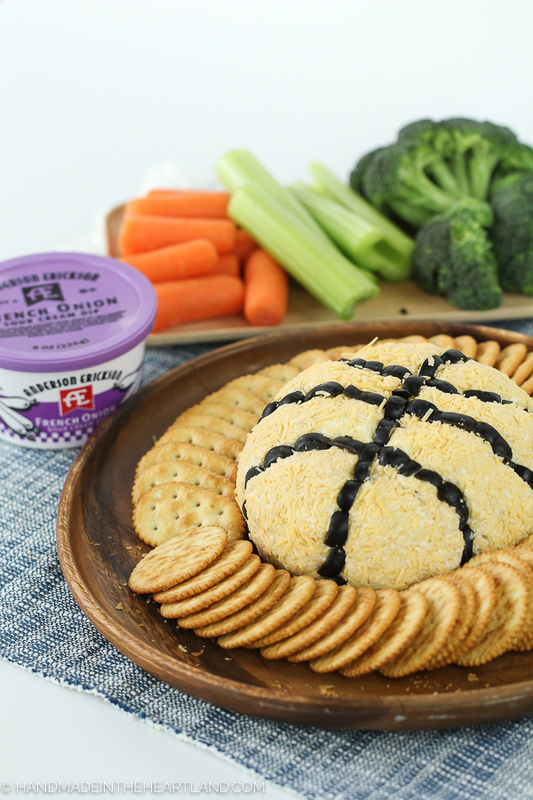 This basketball cheeseball is perfect for your March Madness watch parties. 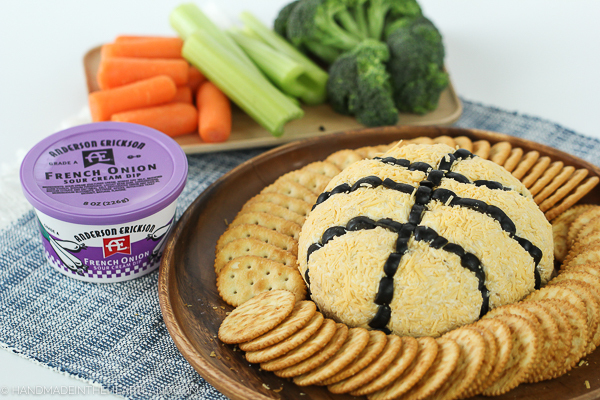 This french onion basketball cheeseball is the perfect appetizer for March Madness parties. With wet hands form the mixture into a ball and roll it in shredded cheddar cheese to coat all sides. Wrap the cheeseball up in plastic wrap and refrigerate for 2-3 hours. Decorate like a basketball with slices of black olives that are sliced in half like a moon shape. Keep in the fridge until ready to serve! Enjoy!